A long exterior shot of the Necropolis. This is one of the largest and most detailed pieces of scenery I've ever made! It took about a month to build and three days to paint. The main component was a plastic castle front from one of those imitation Lego toys. I extensively detailed it, including the interior. This is the first time I've done an interior for a building, and let me tell you, it's a lot of work! 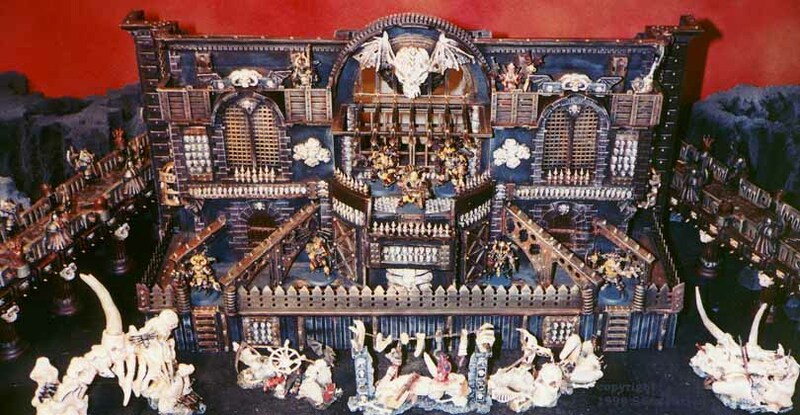 Although mainly a chaos piece, I plan to make some modular parts that I can swap in to make it look more Imperial- that way it can double as an Imperial church, prison or fortress suitable for the Adeptus Sororitas. A closeup shot of part of the exterior. The spikes that run up the buttresses are rubber floor matting cut into strips- the floor mat had a spikey pattern on the back to keep it from sliding. Dangling from some jewelry chain is a skeleton (plastic figure) crammed into a cage (from a pirate ship toy). 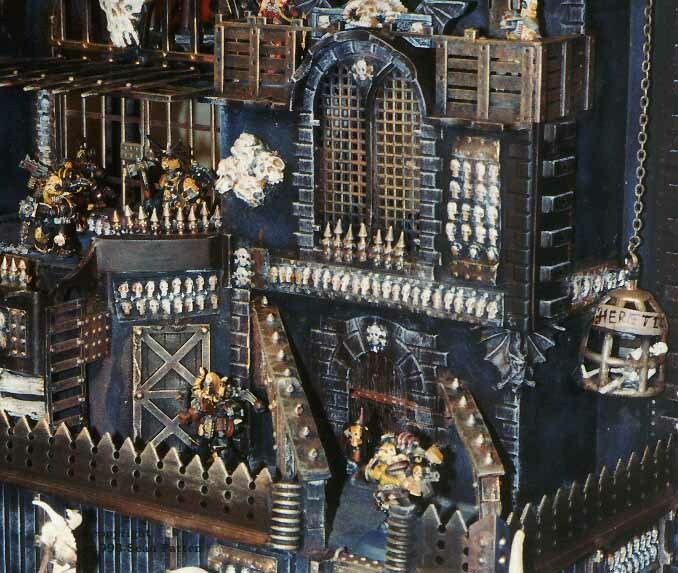 The spikes around the balcony are from the old plastic Battlewagon kit (no longer available). You can still get some of the spikey bits on the Track Sprues included in the Gorka Morka Bitz set. The spikey railing at ground level was cut by hand mostly, although the holes were already in the piece I started with. HO scale railroad track provides most of the ladders. All of the skull detail is actually sculpey castings out of a mold I made myself- great for detailing large, flat surfaces. An interior shot of the Necropolis. This shows about 2/3 of the whole thing. In addition to the walkways at the roof level, there are three interior levels. Note that on both sides, ladders run up the side walls (not seen here) to allow access between the floors. The main floor includes the entry gate, a chandelier (from a "Phantom of the Opera" McFarlaine toy), tables, and screens for the main windows. All the winged skulls seen are charms I bought at a bead store. The middle floor has a torture chamber (that's the chair in the middle with chains on it), some nice columns, and vented boards over the ground level windows. 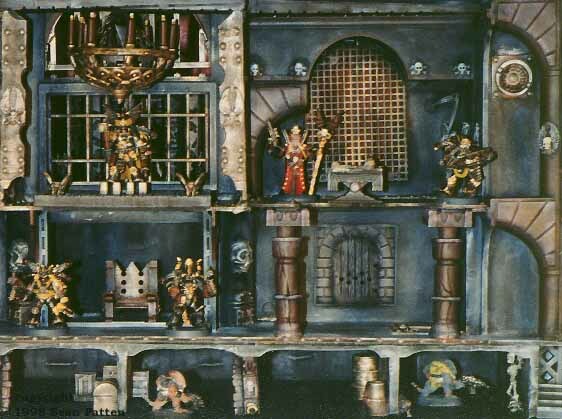 Metal grates in the floor (barely visible behind a column) lead to the dungeon. The dungeon is at the bottom, of course- just barely tall enough for a Skaven to fit in. Note the skeleton chained to the wall, and the various supplies in storage below.